Oslo is getting ready to be proactive for future population needs. Oslo is populated by approximately 624 000 inhabitants. They all benefit from the social care sector which is publicly financed through municipal, non-profit or private organisations. By 2040, Oslo is projected to have twice as many citizens aged over 67, and a corresponding increase in municipal services would not be sustainable. Nor would sufficient carers be available at that point. An innovative approach to the organisation of care and nursing services will be required, and the use of resources must be coordinated. The City Government is learning that senior citizens nowadays are more healthy and resourceful than ever before. They play an increasingly important role for both themselves and for the local communities. 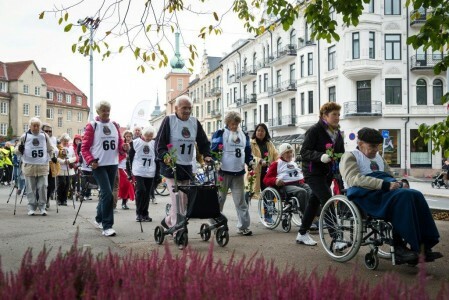 Oslo will be strategically working on changing the society’s perception of older senior citizens. The report presents the City Government’s policy, arising issues and strategy guidelines with a timeline perspective spanning over 10-15 years ahead. The central focus of this report is that seniors in Oslo should be able to live independent, active and safe lives and stay healthy for as long as possible. Promoting a high quality of life for senior citizen, this policy report aims to empower the older seniors with opportunities to continue to contribute to the enrichment of society, which reflect and echo the wishes of most citizens. The Commissioner for elderly has involved all sectors, districts and the Central Council for the Elderly in Oslo to implement an age friendly city concept, emphasizing active participation of the seniors themselves. The senior centers have a long tradition and play a significant role for seniors to mingle with other peers in social, physical and cultural activities. Oslo is looking to expand some selected existing senior centers by co-locating health life centers, and training and empowerment centers in order to strengthen the services for this target group. These selected senior centers will provide information on how to adapt homes and the various available support equipment, housing options for seniors and new approaches to housing, activities and public services, the use of welfare technology. The national “Action Plan for Increased Accessibility for People with Disabilities” was launched in 2005 and presents goals, strategies, actions and resources. The action plan’s overall vision is that Norway will be accessible for everyone by 2025, and that the universal design concept will be applied to all public services pertaining to transporting, building and outdoor environments, communication and information. The Oslo City Government developed the first strategic plan for universal design in April, 2009, with revision and reevaluations every 4th year. In spring 2014, the strategic plan was revised and adjustments were included, reporting that Oslo aims to become a universally designed city by 2025. The report also states that all of the agencies and companies in Oslo must implement and incorporate universal design in their business operations by 2025. The agencies have to prepare individual action plans for universal design in order to accomplish this superior goal. The Oslo City Government joined the WHO Global Network of Age-friendly Cities and Communities in May of 2014 as the first city in Norway.